The beneficial reasons for using soap may be diminishing in the sense that commercial soap is produced with so many chemicals that it could cause more harm than good. Due to vague labeling procedures, soap can actually contain thousands of harmful chemicals leading to cancer, asthma, hormone distortions, thyroid issues and endocrine distortion. Your skin is an organ, a pathway to your body’s inner workings, and approximately 60 percent of everything that comes into contact with your skin is absorbed. Knowing the facts about the soap you use daily may be frightening; however, it is essential to your long-term health. If you are on a cleanse and still using soap, well, you may want to rethink what is in your body. The various chemicals found in soap have been recently found to stay awhile in your body, according to a 2013 study conducted in an urban community in western Canada. Parabens are synthetic compounds found in most soap due to their antibacterial and antifungal properties. Sure, everyone likes to be clean and bacteria free, but at what cost? Parabens have been found in research subjects long after exposure, especially in breast tissue. A study published in ISRN Toxicology (2013) states, “Paraben exposure may be linked to breast cancer, thyroid dysfunction, allergy, and obesity.” Parabens are known to be in various products including soap, cosmetics, toothpaste, sunscreen and may contribute to hormonal disruption long after exposure. Hormone disruption can be a severe physiological issue and may cause all sorts of secondary medical problems. Soaps containing parabens, especially anthropogenic parabens, can upset your body’s natural hormone production. Parabens have been recently found to imitate a key hormone, estrogen. By imitating estrogen, becoming xenoestrogen hormones, your body thinks your estrogen levels are too high and it will begin to take action. Your body’s response to exacerbated estrogen levels may cause serious health problems like obesity, a decrease in overall muscle mass and reproductive concerns. “Paraben Levels in an Urban Community of Western Canada” (2013), authored by Dr. Stephen Genuis reported, “Previously regarded as safe, parabens have recently drawn concern with increasing evidence of the hormone-disrupting potential of these compounds.” In a conscious effort to promote healthier products, many cosmetic companies have pulled products containing paraben from the shelf. Denmark has also banned any cosmetic products containing paraben that children under the age of three may be exposed to. If you have ever glanced at the FDA consumer’s guide on your soap, you may notice a “synthetic fragrances” or “fragrances” line. Many of us like pleasant smelling soap, however, some of those downright delicious smells may be the cause of allergies and asthma. Soap can contain up to 3000 different chemicals within the “fragrances” label, and it is essential to investigate these chemicals for potential health risks. A 2012 study published in Environmental Health Perspectives states, “Exposure to fragrances has been associated with a range of health effects, including allergic contact dermatitis, asthma and asthmatic exacerbations, headaches, and mucosal symptoms.” A few notable chemicals found in “synthetic fragrances” are phthalates, polycyclic and nitro musks. Phthalates are commonly found in pesticides and are linked by scientific evidence to cause health problems in human studies. First a bit of physiology! Your thyroid is the gland responsible for your body’s ability to grow and maintain a healthy weight through metabolism control. Your thyroid is connected to your endocrine system, which controls all the hormones in your body. We previously discussed soap as an estrogen imitator, and soap’s grasp on your entire endocrine system goes even deeper. Soap contains a pesky chemical called triclosan or TCS, which is found in antibacterial soaps. Triclosan may have serious implications on your body’s thyroid and may also be responsible for creating bacteria that are resistant to antibiotics, according to recent studies. 30 percent of bar soaps contain triclosan with even higher levels found in antibacterial soap. One study published in the Journal of Applied Toxicology (2011) found that “the potential for endocrine disruption and antibiotic cross-resistance highlights the importance of the judicious use of TCS, whereby the use of TCS should be limited to applications where it has been shown to be effective.” Another disturbing fact, triclosan subsequently creates a harmful carcinogen in the body called dioxin. Dioxin can be found in Agent Orange and can be passed from mother to child through nursing. Triclosan and dioxin can seriously affect a child’s growth and central nervous system if exposed to high levels. Breast cancer is a weighted topic, and the chemicals used in soap are becoming a target in various studies around the world. According to the Centers for Disease Control and Prevention (CDC), breast cancer is the most common cancer in women and the second deadliest cancer. Parabens are common chemicals found in breast tissue. Research conducted at the University of Reading, UK, by Dr. Darbre and colleagues found parabens in breast tissue extracted from tumors. The 2004 study states, “These studies demonstrate that parabens can be found intact in the human breast,” specifically methylparaben accounting for 62 percent of parabens extracted from breast tumors. Soap and other household items, including cosmetics, also contain xenoestrogens, which have also become a topic of much anticancer research. Xenoestrogens are parabens, imitating estrogen in the body and causing an endocrine system imbalance. A study published in AntiCancer Research (2010) discusses the role xenoestrogens play in breast cancer-related health problems and how preventive measures could be taken. Using chemical-laden soap can have long-term effects on your skin. Soap can dry your skin out and strip it of its natural protectants. All of our skin has oils and layers of protection; however, the sulfates in soap diminish those natural properties. Sulfates found in soap are used to create the foam and lather while you wash. Lauryl sulfate is one of the most common chemicals found in soap and it has been the culprit of irritated skin after long-term use. Dry skin or xerosis is a common condition often caused by climate, and yes, even the products we use — which may claim to make your skin hydrated. The use of antibacterial soap products has become less for hospital use and more for around the home in recent decades. You can browse the shelves of your local supermarket and find loads of options for aromatic antibacterial soap to purchase. If you read the label, you may not see anything dirty about what is listed; however, take caution. The use of antibacterial soap has been a scrutinized topic, and with antibiotic-resistant germs on the rise, it may be best to stick to an alternative hand soap. Research conducted by Dr. Allison E. Aiello and colleagues at the University of Michigan, “Consumer antibacterial soaps: effective or just risky?” (2007) concluded, “Several laboratory studies demonstrated evidence of triclosan-adapted cross-resistance to antibiotics among different species of bacteria.” Triclosan, previously mentioned to have significant effects on the thyroid and endocrine system, has also been found to create drug-resistant bacteria. There are several crucial reasons to stop using conventional soap! 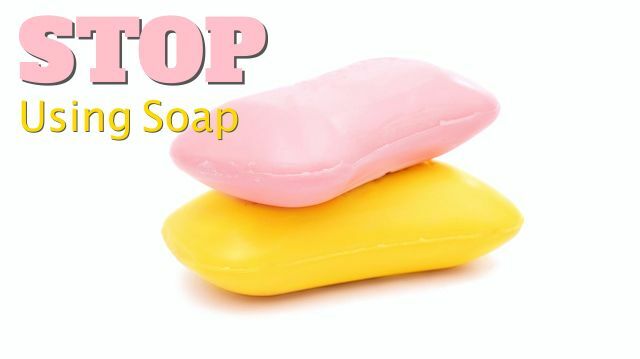 If you are out and about at your local grocery store or pharmacy, swing by the soap aisle and have a look at the ingredients in some of the soap commonly found on the shelves. Take a moment, pull out your smart phone and start searching some of the ingredients. What you find may surprise you! The good news is that healthy options to conventional soap do exist. Our favorite is Castile soap. It is non-toxic and free from harsh preservatives, fragrances, or dyes. You can also make your own toxic-free soap that will actually feed your skin, not rob it of its protective oils and leave a toxic residue lingering. Next articleIs Your Dog Using Your Hormones to Form a Love Connection? Hey Buddy!, I found this information for you: "7 Reasons to Stop Using Soap". Here is the website link: https://www.thealternativedaily.com/reasons-stop-soap/. Thank you.